This year, 2015, marks ten years since my family last had what for us will always be a ‘normal’ Christmas. It was the last time my parents were both alive and well. It was the last time we did what we’d done every year, in one form or another, as long as I could remember: we opened gifts at home, then trooped off to my parents’ home for more gifts and breakfast, then to my aunt’s home for more . . . back to our home for a rest and then off to my sister’s house for Christmas dinner. Lots of running around, lots of hither and yon, lots of food and lots of family. This is the time of year plenty of people grouse about their family. I hear groaning about parents, about having to see all those family members with whom they don’t agree politically or religiously, about the travel and the fuss and the mess. And I think . . . you don’t know how lucky you are. Now, don’t get me wrong. I know I’m blessed. I know that for nearly 40 years, I had an amazing extended family who supported me, who spoiled my kids, and with whom I had an extraordinary shared history. I know that I’m still blessed because I have an unbelievable husband, five fabulous children, and a sister, two brothers-in-law, a sister-in-law, a niece and six nephews. We’re not geographically close, but I’m lucky to have them. I was never one of those people who complained. When we lived in Hawaii and then in Wisconsin, my husband and I were anxious to move closer to our family. I appreciated them. I loved every gathering, every function I was invited to attend, every wedding, christening and other celebration we had. I loved impromptu lunches or breakfasts with family, running into them at stores and even the big birthday parties. Now we live in Florida. We have wonderful friends, and I’m happy for that. But this time of year, I feel even more keenly what we lost in between June 2006 and June 2007. When the song “Home for The Holidays” comes on, I cry. When I hear “I’ll Be Home For Christmas,” I cry. It’s been ten years, and I’m not sure that sense of loss ever goes away. Thinking about this today as I was running Christmas errands, it struck me that maybe that’s why it’s so important to me to write about families. All of my books include strong families, even they’re non-traditional: Crystal Cove is all about Jude and the family she’s both inherited and created. Burton includes the Reynolds, the Evans, the Wallaces and the Nelsons, who all come together to form a large and loving family. Ava’s family in the Perfect Dish Romance series is near and dear to my heart. And the folks in the paranormal world–Jackie, Lucas, Cathryn, Rafe, Nell–they’re a sort of family, too. Perhaps a tad dysfunctional. . . It doesn’t surprise me that through my books, I’ve subconsciously re-created the family I miss and crave. Actually, it offers me comfort. And in effect, you, my readers, have given me a whole new sense of family. 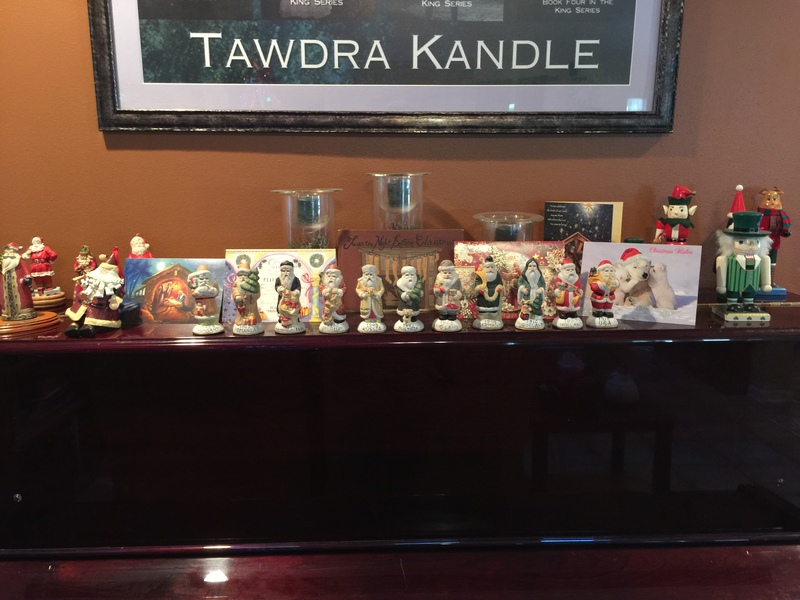 This year, my piano is decorated with cards from my readers. That makes me enormously happy. So thanks to all of you for reading about my families, for indulging my need to write about them and for being so wonderful to me. Big hugs and hearts. I understand completely family is very important and those no longer with us are missed so much.